cant be created using Windows Explorer or Command Prompt directly! 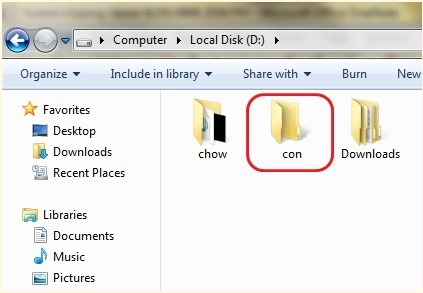 Explanation: This would create a folder named "con" on your "C Drive"
Explanation: This would remove the folder named "con"! would give error that "folder is not empty"! Select rename & type: "ALT+255"(Use Numpad)..thats it! ALT+255 stands for blank character in ASCII...so it still accepts your folder name! how those md\\.\\c:\con posible? what is the use of \\.\\ and why cant we just use md c:\con? i give u one suuggestion to create this (con & aux) both folder it is possible. Give Name Con to the folder but dont't press enter use Alt + 255 and then press enter key......and you surprized that ur folder created as well as aux folder !!! !